MISP is an EU funded project focused on supporting environmental and economical infrastructure projects in Serbian municipalities (drinking water, waste water treatment, solid waste management and industrial zones). 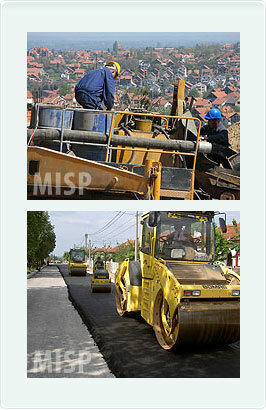 Since 2005, more than 20 projects with a total value of over 68 million Euros have been implemented. Eptisa, a Spanish engineering consultant leading a consortium with two other international consultants: Royal HaskoningDHV (NL) and VNG (NL), has been appointed for implementation of the MISP project. A team of 60 international and Serbian experts executes the project from the project office in Belgrade. National Strategy for PUC Reform and Action plan for PUC Reform. Municipal infrastructure projects prepared for funding. Introduction of Financial and Operational Performance Improvement Plan (FOPIP) programs in Pirot, Sremska Mitrovica/Šabac, Kruševac, Vrbas , Leskovac, Velika Plana/Smederevska Palanka and Valjevo/Lazarevac/Ub/Mionica/Lajkovac to enhance the operations of the Public Utility Companies.